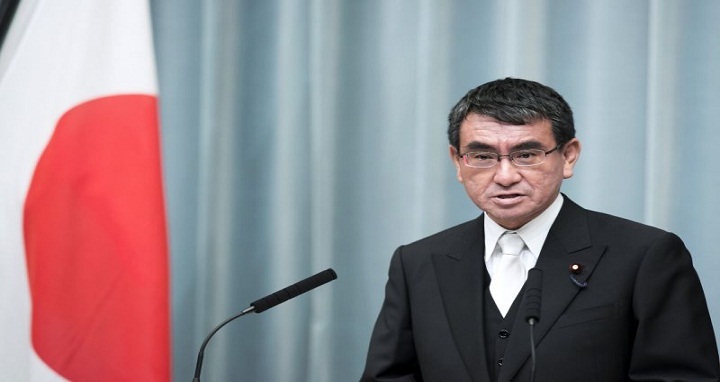 Dhaka, 6 August, Abnews: Japanese Foreign Minister Taro Kono arrives here on Tuesday on a brief visit to further promote the Bangladesh-Japan comprehensive partnership and discuss other issues of mutual interest including Rohingya crisis. Foreign Minister AH Mahmood Ali and his Japanese counterpart Kono will have a bilateral meeting at state guesthouse Meghna on Tuesday evening, a senior official at the Foreign Ministry told UNB. A joint briefing will take place after the meeting, said the official. The Japanese Foreign Minister visited Myanmar on Monday before visiting Bangladesh as the Japanese Foreign Ministry in a one-sentence message mentioned about Kono's attendance at ASEAN-related Foreign Ministers' meetings and visits to Russia, Myanmar and Bangladesh from July 30-August 8. Japanese Foreign Minister Kono and State Counsellor of Myanmar Aung San Suu Kyi discussed on Monday how to resolve ongoing Rohingya crisis, international media reported. Japan, according to Japanese Foreign Ministry, will continue to fully support Bangladesh's development on all fronts so that the country can attain "newly industrialized economy" status by 2021, through the 39th Yen Loan Package (total 200.4 billion yen). On May 14 Minister Kono held a Japan-Bangladesh meeting and working dinner at Iikura Guest House with Foreign Minister Ali. Minister Kono, during the meeting, stated that Japan will further promote the Japan-Bangladesh comprehensive partnership and continue to fully support Bangladesh's development on all fronts. In addition, Minister Kono explained that Japan will further strengthen the bilateral relations towards the 50th anniversary of diplomatic relations in 2022 and requested the Government of Bangladesh to continue to secure the safety of Japanese people. Diplomatic sources say Japan highly commended the efforts made by the government of Bangladesh in accepting Rohingyas from the Rakhaine State of Myanmar and the ongoing dialogue with the government of Myanmar. On the other hand, Commonwealth Secretary-General Patricia Scotland will be here on a two-day visit on August 8 to have discussions with head of government, ministers and other public figures on priorities and commitments. She will also visit Sri Lanka and Brunei as part of her first official visits to three Commonwealth member countries in South and South East Asia. Scotland will meet Prime Minister Sheikh Hasina on August 9 apart from holding meetings with Foreign Minister Ali and State Minister for Foreign Affairs M Shahriar Alam, an official told UNB. The Commonwealth Secretary General will attend a lecture on 'Commonwealth Advantage: Progress & Potential' on Wednesday at Bangladesh Institute of International and Strategic Studies (BIISS) auditorium in the city as guest speaker. Foreign Minister Ali will attend it as the chief guest while State Minister for Foreign Affairs will attend as special guest. "Sri Lanka, Brunei and Bangladesh are greatly valued members of the Commonwealth family," said the Secretary-General ahead of her travel, "I look forward to acquainting myself more closely with the many encouraging and positive developments taking place in the region - and with challenges which the convening power of the Commonwealth can help to tackle."